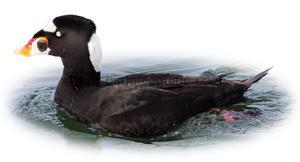 The Surf Scoter has an all-black body except for the neck and head markings. Note the lack of wing markings; the uniform dark wings are diagnostic. The Male Surf Scoter in Winter is a dark black bird with a bright white nape and a white forehead. Its bill is bright orange with a white base and a black patch on the side. The Surf Scoter is smaller than the Velvet and Common Scoter. The Surf Scoter is the smallest Scoter, however unless other Scoter are around this may not be apparent. The Surf Scoter is a marine species going ashore on remote tundra to breed. The Surf Scoter breeds in Canada and Alaska, moving South to Northern America in the Winter. A rare vagrant in the UK with only a few sightings per year. 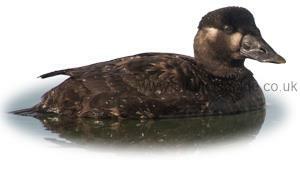 The Female Surf Scoter is a sooty-brown bird with no white markings. It has pale patches on the side of the head and occasionally the nape and throat can also be pale. The Surf Scoter is smaller than Velvet and Common Scoter. 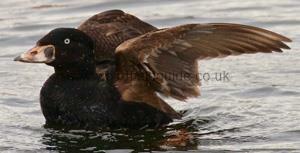 Nice video of Male surf Scoter diving, note the diving action which can be diagnostic. 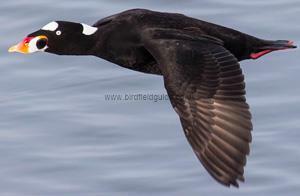 Mixed flocks of Scoter are typically seen 'rafted' in large flocks well offshore. This Young Male Surf Scoter is in his 1st Winter plumage, very similar to the adult Male however the bill has not yet fully developed it's distinctive markings. The Female Surf Scoter can be hard to identify from other Scoter. Note the heavy bill and head profile of this female bird which is almost Eider like.